Come Celebrate Día de los Muertos with SUA! 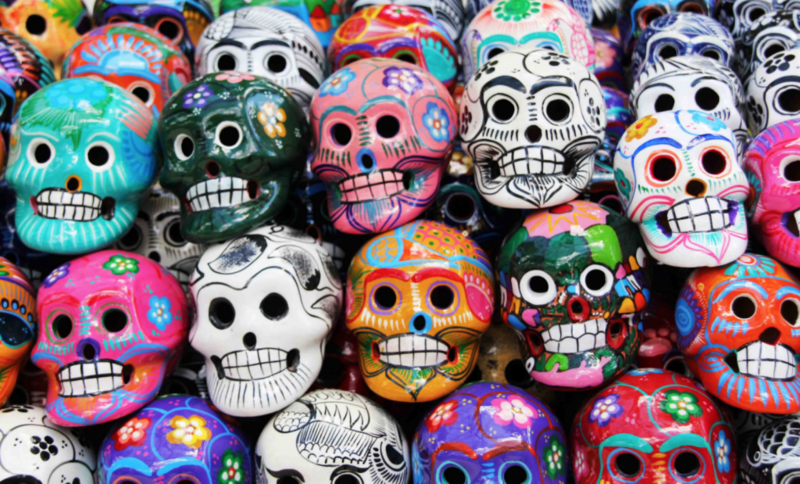 Even though it is of Mexican origins, Día de los Muertos is a holiday that everyone can get behind. It is a holiday that is centered around remembering beloved friends and family members who are no longer with us. I’m sure most of us have experienced losing someone we love or at least know someone who has. Well, Day of the Dead is the time to remember them, whether that be through preparing one of his favorite meals or bringing flowers to her grave. Honor the ones that you’ve loved by dedicating this special day to them. One popular aspect of Day of the Dead is the sugar skulls or “calaveras.” These are typically made and decorated to be placed at the altars of the deceased. They can be made out of sugar or clay and are decorated with icing, beads, and feathers, with the finishing touch being the name of the departed loved one inscribed on the forehead of the skull. Two variations of this include wearing a calavera mask or by painting your own face to resemble a skull. One reason this is done is because it is a positive symbol of death or rebirth after death. If you have been fortunate enough to not have to lose anyone, there are other aspects of Day of the Dead that might pique your interest. Just like the celebration SUA is putting on, there are a multitude of festivals that are organized throughout the country paying homage to the special day: people donning skeleton costumes fill the streets, dancing to music building altars, and walking in parades. In fact, many towns have turned the celebration into a community event by collaborating with museums and art companies, who change their displays to be mainly composed of traditional mexican artifacts and paintings. Whether you’ve celebrated it before or this is your first time, come see what festivities SUA will be offering on Wednesday, November 1 from 7-9 pm in the Kansas Union Ballroom on level 5. We have a great menu lined up – we’ll be enjoying conchas, pan de muerto, chips and salsa, atole and tamales! SUA is partnering with KU Latin American Student Union, Beta Xi Chapter of Phi Iota Alpha Fraternity, Inc., KU Latin American Graduate Organization, and KU Center for Latin American and Caribbean Studies. ← Mini Art Workshop this Tuesday!